One of a number of slot games that adopts the idea that less is more, 8 Ball is a traditional Vegas style three reel game which takes the game of eight ball pool as its theme. Displaying to its players a classic one armed bandit style slot machine, the game’s reels are all populated by symbols simply showing off different pool balls. 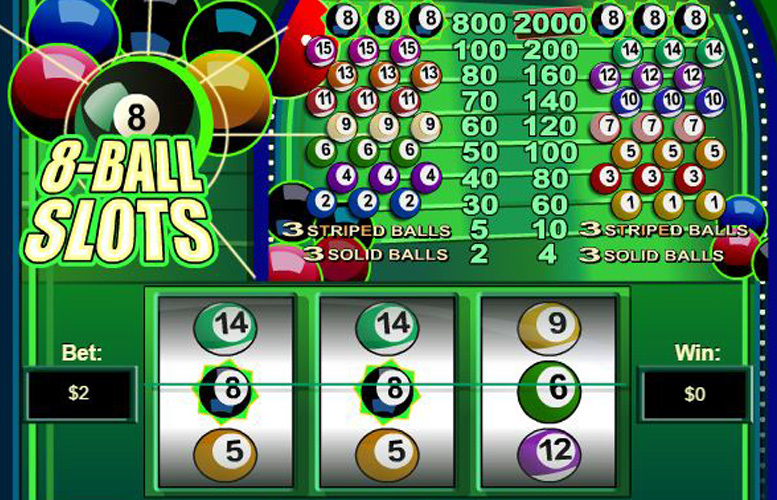 Incredibly straightforward and easy to both understand and play, 8 Ball offers some really generous potential jackpots. 8 Ball’s top jackpot of £40,000 is a little lower than some more modern style online slots, but is much generous than those usually found with traditional Vegas style slots. The game could hardly be easier to understand or to start playing, even if you have never played a slot game before in your life. The pool theme is interesting and fun. The simple gameplay is also very repetitive and will get boring for many players very quickly. That repetitiveness of the slot is further fuelled by the lack of any side games or extra features. Staking choices are very limited, with the range of available wagers per spin only stretching from 1p to £10. Thanks to its classic Vegas style and simple three reel format, it couldn’t be easier to understand how to win by playing the 8 Ball slot. All you need do to receive a payout, after all, is see three matching symbols line up along the game’s reels after a spin. The most valuable such three symbol combination possible for this particular slot is – unsurprisingly given the game’s overall theme – one which depicts three 8 Ball symbols. If a player chooses to bet one coin per spin, that particular combination pays out at a rate of 800 times their bet. If they bet two coins, meanwhile, the same combinations pays out a jackpot worth 2000 times the bet. That means that for players who have selected the two coin option and set their coin value at the maximum possible £5, the top jackpot delivered will be worth a cool £40,000. Whilst that is a little lower than the jackpots of many slot games, it is significantly higher than those generally offered by similar three reel Vegas style games. 8 Ball is very much a slot game for the purist, and as such there are no real additional features beyond the main game. The slot’s classic, traditional format, after all, does not leave any room for the inclusion of wild symbols, scatter symbols, bonus games or other commonly seen extra features. As we’ve already touched upon, all of the symbols on the 8 Ball reels are regular symbols and they all similar depict different 8 Ball pool balls. As in pool itself it is the 8 Ball which is the most important and valuable, and in this slot aside from that, the higher the number on the ball the better. A combination of three 14 Ball or 15 Ball symbols, for instance, is the next most valuable behind the 8 Ball combination. Those combinations pay out at a rate of 100 times the bet per line when one coin is selected and 200 times the bet when two coins are chosen. After that, three 13 Ball or 12 Ball symbols pay out jackpots of 80 or 160 times the bet level at either the one or two coin bet level respectively. In common with most similarly formatted games, 8 Ball’s setup means that players’ options when it comes to setting their stake per spin are somewhat limited. They can, after all, only choose between betting one or two coins per spin and set the value of those coins. There are a handful of different available coin values, however, ranging from a minimum of just 1p and a maximum of £5. What all of that means is that the range of staking options per spin for players extends from a minimum of 1p to a maximum of £10. As is so often the case with minimalist Vegas style slot games, whether you like 8 Ball or not is likely to depend upon what you’re looking for from a slot. If you’re simply interested in an easy to play game which could deliver really impressive payouts, for instance, 8 Ball may well be right up your street. If you get bored by repetitive and simplistic slots, however, and like to see wilds, scatters, bonuses and other features then this game is unlikely to be for you. Aside from that matter of personal preference, however, 8 Ball does compare well with other similarly formatted games. Its top jackpot of £40,000, for instance, is one of the better payouts around and its theme is an original and a fun one. This game has a rating of 5 / 5 with 488 total reviews by the users.